Your favorite buffing cloth in a larger size! Fold it four ways for all your buffing needs! The first thing you may notice about the Chinchilla Microfiber Buffing Cloth is that it is named after a South American rodent. At first this may seem odd, until you realize the Chinchilla is known for its ultra soft coat of hair and silvery gray color. Much like its namesake, Chinchilla Microfiber Buffing Cloth features a thick pile of dense gray microfiber surrounded by a red border. Chinchilla Microfiber Buffing Cloth redefines the terms soft and dense as they apply to microfiber towels. The dense pile of the Chinchilla Microfiber Buffing Cloth weighs in at a thick 600 g/m�. The dense pile is extra long and super soft, with long microfiber threads that allow dirt and grime to gather between the pile, instead of being rubbed against the paint. 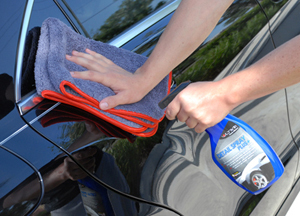 The increased surface area of the Chinchilla Microfiber Buffing Cloth makes it idea for applying quick drying spray waxes, waterless washes, or quick detailers. The microfiber is so soft that it will not mark, swirl, or dull even the softest, most delicate paints. The Chinchilla Microfiber Buffing Cloth is so soft that you may forget it is named after a rodent! 16 x 24 inches.